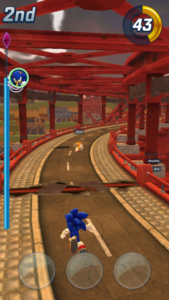 SEGA’S Sonic Runner Game “Sonic Forces: Speed Battle” Has Been Released Worldwide. Are You Ready To Compete With Real Players? Sonic Forces Is An Online Multiplayer Game In Which You Play As Sonic The Hedgedog Or Choose Another Runner. You Compete In Real-Time With Real Players Around The World. Your Goal In This Game To Be The First One To Complete The Race. Collect Rings, Boosters, Avoid Obstacles And Compete With Your Rivals. Graphics Of This Game Are Amazing, Awesome, And Great. This Is A Challenging Game – You Have To Avoid Obstacles – Otherwise You Lose Your Speed. The More You Collect Rings The Faster You Run. You Attack With Mines, Lightning, Fireballs, Tornadoes, And More. Up To 15 Characters Are Featured In This Game – Sonic, Amy, Tails, Knuckles, Shadow, Rouge, And More. At The End Of Each Round, On The Basis Of Your Performance/Ranking, You Will Get Reward Box. Open It And You May Get A New Runner, Booster, Or Other In-Game Currency. You Can Double Your Reward By Watching An Ad. Upgrade Your Characters, Items With Rings. RIngs Are Important, Try To Collect All. Speed Of Runner Is Too Fast – Lightning Speed. You Swipe Up, Down, Left, Right To Control Your Runner. There Are Many Obstacles To Avoid i.e. If You Get In Touch With Ice – Then Your Speed Will REDUCE And Your Rivals Will Go Ahead. You Can Play Sonic Forces: Speed Battle Online Only. There Is No Offline Mode. So, You Must Have An Active Internet Connection. Many Tracks With Cool Locations Are Locked. You Have To Win Trophies To Unlock A Variety Of New And Challenging Tracks. Overall Sonic Forces: Speed Battle Is A Great Game, Graphics Are Excellent, You Should Play This Game. Size – 88 MB, Price – Free(Contains Ads, In-App Purchase). Download- Here.